This line-up has recorded two demo albums. 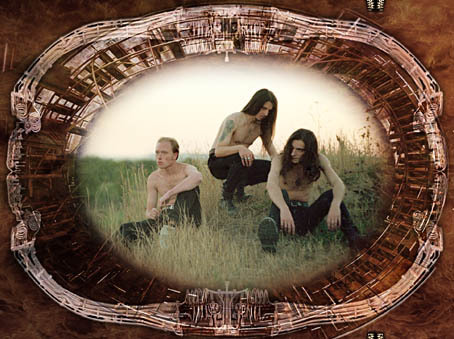 In November 1992 album «Hell `Em All» of 9 tracks was recorded in Machine Studio and group became quite popular between Russian underground. Since December 1994 till January 1995 group has recorded second demo in Other Side Studio. The name of this album was «S.A.T.C.L» (Sexual Attruction To Corporal Lips). This album includes 5 songs+intro and outro of 45 min of total time. This work has stabilized status of the group and has brought some favorable rewievs in press. Some part of copies was sold in Russia and abroad. After Sharp (keyboard) arrival in 1995 the name was changed on Mystical Gate. In 1996 group has came in NMLK Studio for recording third album. «In Sadness Gloom» was recorded since June till August 1996. During the same time group gave series of concerts including live in Volgograd together with Tales of Darknord. During recording «In Sadness Gloom» group has got in touch with legendary Urals label Undead Wood production (which released albums of Thy Repentance and Russian Winter). As a result of negotiations the agreement of release album by Undead Wood production has been reached. Material was sent in Ekaterinburg but wasn`t released because of closing of the lable. On account of different external and intrinsic causes after failure of «In Sadness Gloom» release group has loosed their activity for a long time. In the beginning of 2004 new Russian lable Stygian Crypt productions has got in touch with Mystical Gate with a suggestion to issue CD with material of «In Sadness Gloom». Contract was signed after a short conversation and in October 2004 album has brought out.